Fig. 2. 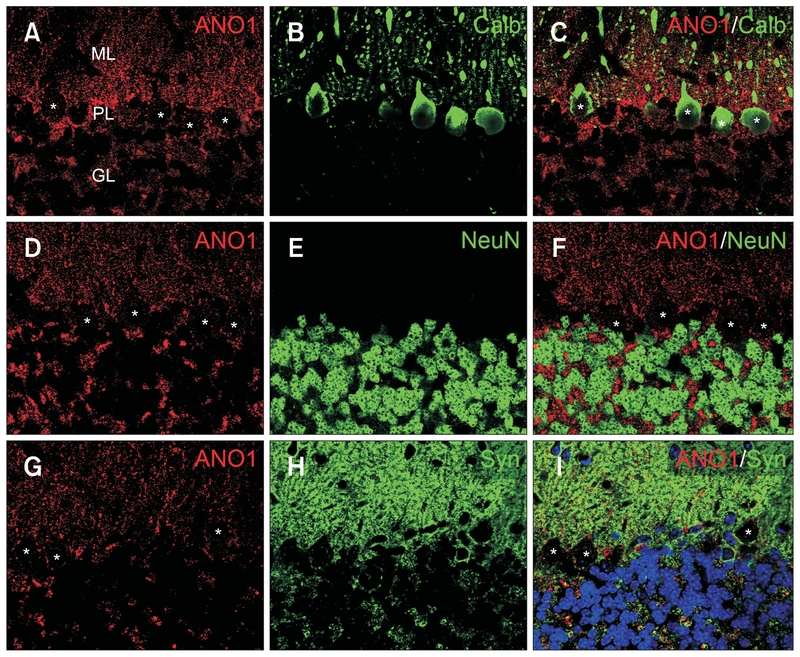 Cellular identity of the anoctamin 1 (ANO1) in the cerebellum. Confocal micrographs taken from coronal sections of the mouse cerebellum processed for double-immunofluorescence. (A–C) Double-labeling with anti-ANO1 (A) and anti-calbindin (Calb) (B). In Fig. 2B, calbindin (green) is localized in the Purkinje cell dendrites in the molecular layer (ML) and somata in the Purkinje cell layer (PL). In the merged image (C) of Fig. 2A and B, calbindin-labeled Purkinje cell dendrites and somata (asterisks) did not show ANO1 immunoreactivities (red). (D–F) Double-labeling with anti-ANO1 (D) and anti-neuronal nuclei (NeuN) (E). In Fig. 2E, NeuN (green) is localized in the granule cell somata in the granule cell layer (GL). In the merged image (F) of Fig. 2D and E, NeuN-labeled granule cell somata did not show ANO1 immunoreactivities (red) in the GL. (G–I) Double-labeling experiments with anti-ANO1 (G) and anti-synaptophysin (Syn) (H). In Fig. 2H, synaptophysin immunoreactivities (green) are seen in many parallel fiber varicosities in the ML and some mossy fiber endings within the synaptic glomerulus in the GL. In the merged image (I) of Fig. 2G and H, synaptophysin-labeled endings and ANO1-labeled puncta and patches appear to be colocalized and/or intermingled in the ML and the GL. Asterisks indicate ANO1-unlabeled Purkinje cell somata in the PL. (A–I) Scale bars=50 μm. 2012 © Copyright Applied Microscopy.